What are the Texas Freedom Colonies? Former slaves African American (AA) families aggressively pursued land ownership after the Civil War in Texas. Clusters of agrarian, land-owning settlements or "Freedom Colonies" emerged from secluded areas (Leslie 2013; Baum 2009; Sitton and Conrad 2005). 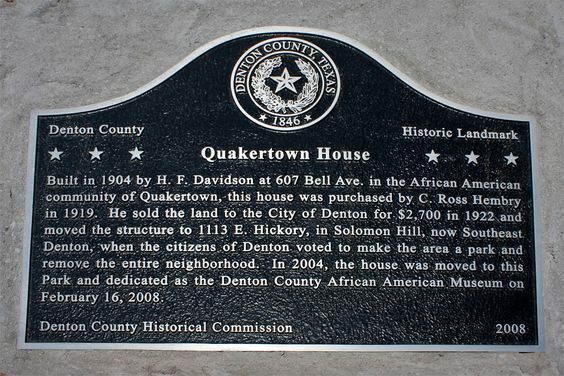 Historical Landmark in Quakertown, a Freedom Colony in Texas. Freedom Colonies is a name coined by historians Sitton and Conrad in a book by the same name. However, they didn't "discover" these places. Freedom Colonies also were known as Freedmen's Towns, "my family place", "where we go for homecoming", Black settlements, or "the Black side of town". Former slaves in Texas founded these communities 1866-1920. Nearly 150 years later, most settlements have lost population, and their landowners have lost property through auctions, partition sales, or outright theft. Few remain on maps or in current census records, but these settlements live on in memory, church anniversaries, and family reunions. Still, a small number of Freedom Colony descendants have retained land and continue to live in rural AND urban settlements for generations. This Project supports their efforts!